Earlier this week, I decided to challenge myself to make a salad from ingredients in our San Diego garden. I found lots of kale, small golden beets and plenty of flat-leaved parsley. The orange tree is still loaded with fruit and our older Meyer lemon tree is at the height of its season. Inspired by Ina Garten’s recipe for a winter slaw, I opted for my version of a slaw rather than a salad. At the last minute, I “cheated” and threw in some red cabbage and a handful of Brussels sprouts from the fridge. Everything came together quickly and easily, and it was fun to prowl around the garden and come up with a slaw for our supper – in February, no less. TIP: Assemble the slaw, toss it with the vinaigrette, then allow it to sit for an hour or two in your fridge. This step will allow the slaw the absorb the vinaigrette and slightly soften the vegetables. A winter slaw made (mostly) with ingredients found in our San Diego garden. Combine the kale, cabbage, sprouts, beets, oranges and parsley in a medium-sized non-reactive bowl. Set aside. Whisk together the oil, lemon juice, mustard, salt and pepper in a small, deep bowl or measuring cup. Toss the slaw with the vinaigrette, cover and refrigerate for an hour or two before serving. Liz, thats a gorgeous slaw/salad and lucky you having all those fruits and vegetables growing in your garden. I always am appreciative of living here, Suzanne, and never take it for granted, drought and all! This is a lovely salad – not only is it pretty, but I can imagine how well the flavors go together. Thanks, Lynda, it was fun to “shop” in our own garden. What a beautiful salad! I love a happy and colorful salad, especially during the winter time, when I’m not so inclined to enjoy a salad. Thanks, Wendy – it was fun. Liz, this sounds so refreshing and delicious and perfect for the Springtime in Winter weather that we are having in CA! I have a few of those ingredients in my garden and know where to find the rest. You are so welcome, Mare – hope that coyote of yours hasn’t eaten all your vegetables! Adore your idea of creating a salad out of your own garden! Shop the backyard, indeed! It is seriously pretty, too. Thanks, Dorothy – I got a kick out of making it. This is new for me, Greg, to grow winter vegetables – I started last year with rainbow chard and we were up to our ears in chard. I also envy you your garden AND your green thumb! I can barely keep mint alive. What a fresh, light salad! Thanks, Lisa – my mint died too – LOL. I love this, it’s so colorful and healthy! 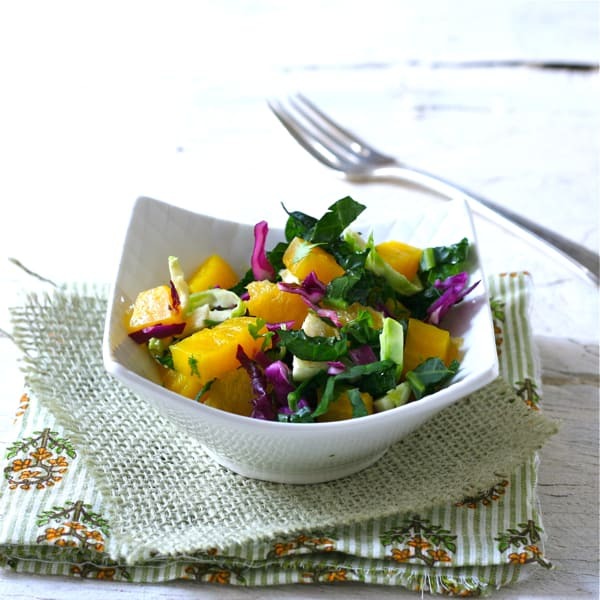 I love the vibrant colors – the golden beets contrast beautifully with the purple cabbage! Reading your garden posts makes me really miss the garden we used to have. Have a great week, Liz. Thanks, Priscilla – and a big hug to Tank. What a perfect salad for winter! It celebrates the freshness of citrus, greens, and beets. All favorites of mine. Definitely making. And another lovely photo!! I love kale and Brussels and golden beets! All of these things in one place sounds wonderful! How amazing that you are able to pick so many of the ingredients for this salad from your garden at this time of year! It was so much fun to gather from our garden, Jayne – harvesting for kale pesto tomorrow.